Oh, that's what I meant. Making the cake look like a container holding a cake, not that it'd actually give you a tape. Taking out a tape and getting health back could be said to... I don't know, maybe something was on the tape and you've solved part of the mystery or something, thus enlightening you on your situation. I don't know, just spit-balling here. I wouldn't worry about that part: It barely has to make sense, once its in-world, it's just for visual effect rather than use anyway. I can always make the in-inventory icon an actual cake so you recognize it and it makes sense while it's ready for actual use. Alright, then. Any other ideas for cake? OH, and here's a list of the mobs which I'll have to skin later, I'd love a solid consensus on what each thing should be, OR IF I should just leave it be and make a creepy version of the regular animal/thing. (player) character default - Generic runner? creeper - the rake? doesnt have bad posture and arms, so IDK. and the rake doesnt go BOOM. 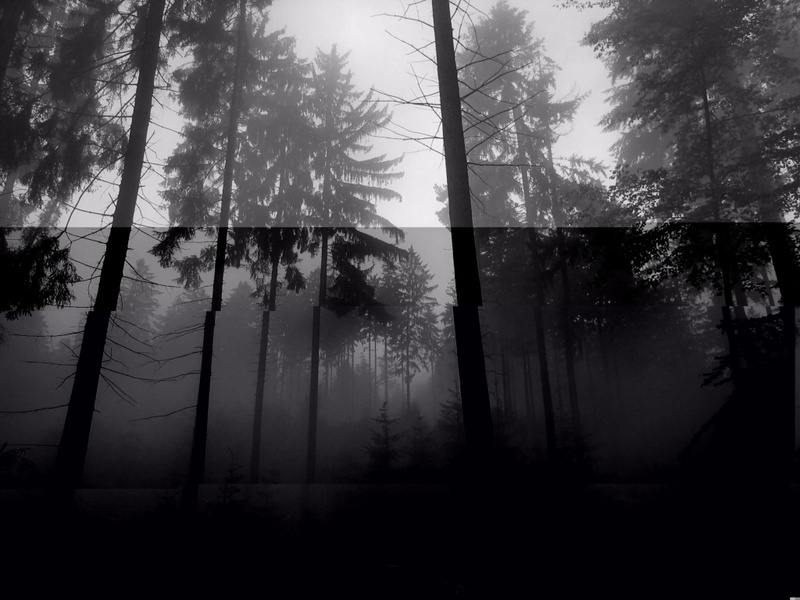 endermen -Slender Man of course. (player) character default - Generic runner? Sounds good to me. chicken - crows? idk. Crows sound fine. cow - How about a sickly-looking cow? Like... Hmm... Giving it a spoiled milk sort of white or something, with really dark spots. creeper - the rake? doesnt have bad posture and arms, so IDK. and the rake doesnt go BOOM. Perhaps we could make it look like another Proxy...? ghast - Well, just wondering, but is it possible you could give it some sort of... invisible texture? I think it'd be really creepy just hearing a ghast and not being able to see it, to be honest. pig - Make it look sickly, like the cow. pigman/pigman zombie - Maybe just generic people that are unaware of the Slender Man? skeleton - We could make it look like another Proxy, I guess, but having it stay the same would be okay with me. I'm sure others have better ideas, though. slime - You could make it into a really dark, 'corrupted' thing, kind of like my idea for mossy cobblestone. Or maybe have it look like it's made of blood? spider - Well, I'm not sure on this one. Maybe the Rake...? I mean, despite a spider having eight legs, the spider could make a good Rake in the fact that it's aggressive towards the player, can climb stuff to get to them, etc. And it doesn't explode, like the creeper. If it's possible to edit out some of the legs for the spider (making them invisible or something, I suppose), it'd make a good Rake in my opinion. squid - I don't really know. regular zombie - proxies? Agreed. I think I love that idea for spider Rake, it's too bad they'll be hanging around and docile during the day, but everything else fits, especially with how deformed the posture is going to look, crawling about; I love it. Invisible ghasts though, while that's probably creepy, that's also pretty impractical... and a fast track to getting yourself pwned. I don't want this to just be an aesthetic style texture pack: I'd really like this to be playable in everyday single player use. I can groove with the sickly animals, but I'm not sure about the pigman/pigman zombies cause in future updates there will be villages anyway. Hmm... I don't know if you've watched Tribe Twelve, Vivi (I think you have, though), but perhaps we could do an Observer kind of skin for the ghasts? Like, all black, a single eye, and weird tentacles... Iunno, haha. The pigman zombies could be like really beat up and insane runners, and the nether could be Slenderman's dimension, which has been theorized about and even used in several slenderverse works. I like the idea of the ghasts being a sort of beast used by the observer. And I suppose the Rake could work as a spider. You can just make two of the legs disappear by making them transparent, right? Because last time I checked, the Rake doesn't have six legs. Oooh. I like the Pigman Zombie idea. Nice, Ladnek. Well, what can I say? Creative is my middle name! *To Archimedes the bird* No it izn't. You can just make two of the legs disappear by making them transparent, right? Because last time I checked, the Rake doesn't have six legs. As I said, theoretically i can. I haven't messed with the mob files too much, but i SHOULD be able to make them dissapear: the only worrying part is whether or not I can make the area where the extra elgs come out covered in a texture, so there's not little holes in the Spider Rake's sides. When I rip open the mobs folder, I'll give you a definitive answer. To summarize: I'll cross that bridge when i get there. That looks amazing, Vivi. Well done. 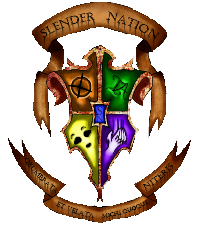 ...and the nether could be Slenderman's dimension, which has been theorized about and even used in several slenderverse works. Are you talking about the Path of Black Leaves? Because if so, that'd be awesome. And the insane runners could maybe be modeled after zero perhaps? (Seeing as he did go insane, plus wielded a sword. Pigmen zombies (as far as I remember) sometimes have swords). And I'm not sure, but is there a specific texture for the leaves of trees grown in the Neather? I seem to remember them being different, but it could just be the lighting there. Just tossing some ideas out there. Man great work so far, this really does sound amazing already. Makes me wish I could help out in some way but alas, best I can offer is moral support. Keep up the great work guys; I look forward to getting to use this in minecraft. Looks pimp, Vivi. I know a lot of people are probably going to hate me for saying this, but what do you think about making the cursor at the middle of the screen look like an operator symbol? You guys KNOW we have to stick it in somewhere, why not there? And ExorcistGamer, you can suggest things. Suggestions from multiple people is what will make this texture pack great (that and Vivi's artistic talent)! Make suggestions! SUGGESTIONS, SUGGESTIONS, SUGGESTIONS. Left to my own devices, there will be few references to blogs, therefore I need everybody's input. ESPECIALLY ON THE MOBS. On the second page at the bottom, there's a list of mobs, almost all of whom I need input on. Looks pimp, Vivi. I know a lot of people are probably going to hate me for saying this, but what do you think about making the cursor at the middle of the screen look like an operator symbol? I don't even think I can change the cursor... I'll look into it, but I'm not even sure thats possible via texture pack. If you have any texture pack with a different cursor, please rip it open, look inside, and tell me what folder/filename it has. Also, totally send me the file itself for the cursor. You guys KNOW we have to stick it in somewhere, why not there? Didn't you see the screenshot on the second page? with the dirt and cactus? That operator symbol in the corner is actually also the spiderwebs. You could put the Operator symbol on the moon, too. Oh, I didn't see that. Well, I saw it, I just wasn't sure what it was. My personal vote is to be on the signs, so it's more subtle. 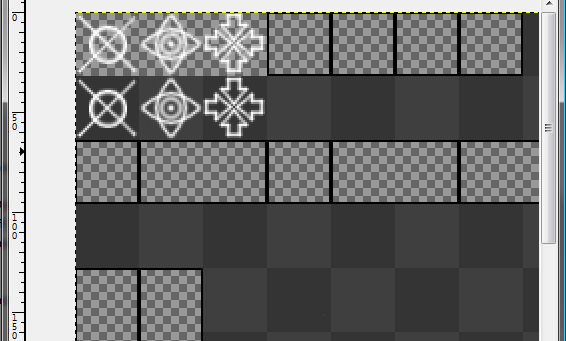 I hate to re-neg on an option I already put out there, but I just realized that I can always edit the paintings available and put the symbol in there, and make it easier for all of you to plaster operator symbols, observer symbols, and even the EMH symbol all over the place. It seems like only three people ever post in this thread and I AM putting quite a bit of effort into this, and trying to get a great deal of the work done before the Enderman mob gets officially released, so I can release the full version as soon as possible. I really need the input from more people, else I might as well be talking to a brick wall and just silently working on my own with this. Lurkers, (if you even exist) please stop lurking. 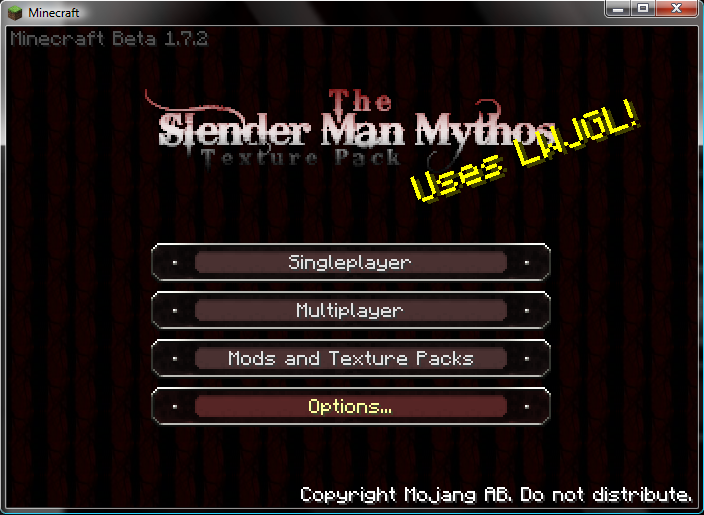 If most everybody doesn't care about this texture pack, then there's no sense in spending so much of my spare time on this. Meh, I'm probably just a whiny jerk with a warped sense of time in comparison to how short a time this thread's been around in order to gain a following for it's cause. Hmm... I change my vote. Operator symbol on the paintings! And thanks, Vivi, for doing this. Also Vivi, you are brilliant and awesome for doing this. And I would suggest more if I could think of stuff, but that's been hard to come by lately. Though if I do think of anything, I'll make sure I bring it up. I'd say go with putting Operator Symbols on the signs. Maybe the Observer symbol would work better as the crosshair if you can edit it? Idk. As for the Nether as a Slendy dimension, I'd say turn the lava into a black substance if possible. With paintings, one the tall ones should be Slendy. One of them could be Masky's mask. Another could be of Damien's bone from Dreams in Darkness and a painting of Redlight from White Elephants. as for paintings, one should defs be like a forest fire. I suppose?